We fabricate a wide range of powder filling machines which are renowned for their outstanding performance as they are widely used to fill all types of freely flowing powders. Sturdily constructed to perfection, our range of powder filling machines are easy to operate or handle and occupy minimal space. Our range includes automatic powder filling machines, semi automatic powder filling machines, single head powder filling machine, multiple powder filling machines, toner filling machines, auger filling machines and capsule filling machines. Our wide range of automatic powder filling machines is renowned widely owing to its high end features such as excellent performance, smooth functioning and easy operation. Equipped with PLC based system these automatic powder filling machines ensures maximum accuracy and output and is easy in commissioning and installation. Our range of automatic powder filling machines is perfect solution to fill all kinds of free flowing powder, talcum powder and toner powder. 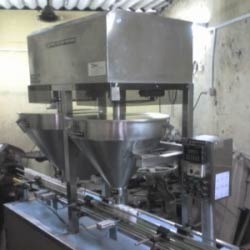 We provide our clients a wide range of AFHSW series semi automatic powder filling machines which are demanded highly as they are used for filling all kinds of powder into bottles, pouches, etc. With a filling range of 50-500 gm, this portable machine is known to deliver an accuracy of /- 1 gm. 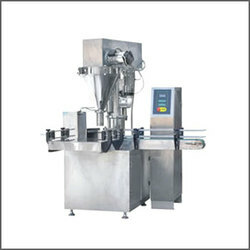 In this machine, the powder to be filled is placed under the nozzle and once the machine presets the amount of water and displays the actual amount of powder on the weighing machine. When the accuracy is ensured in the powder filled, the container is then removed and the process is repeated till it is required. Backed by state-of-the-art manufacturing unit, we offer a wide range of multiple powder filling machines. 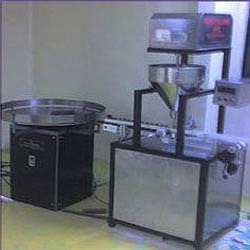 These multiple powder filling machines provide hassle free solution to fill all kind of powders. 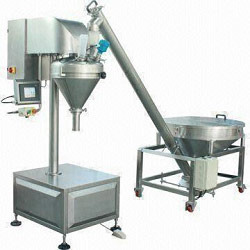 Sturdily constructed to perfection, our range of powder filling machines are easy to operate or handle and occupy minimal space. Fill Capacity: 5 grms to 1000 grms. (with different set of Auger and funnel) Fill range depending upon Bottle opening and bulk density of powder. Power Requirement: 440 Volts, 3 Phase (4 wire System) 50 Hz. We offer clients a meticulously designed range of toner filler machines which is highly demanded and is used for filling all kinds of powder into bottles and pouches. 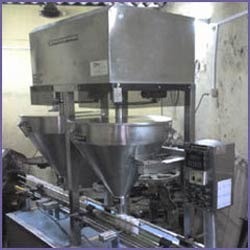 Toner filling machines is an easy to handle machine in which the powder to be filled is placed under the nozzle and once the machine presets the amount of water and displays the actual amount of powder on the weighing machine which ensures accuracy in powder filled, the container is then removed and the process is repeated till required. We are one of the leading manufacturers of auger filling machines which is used for filling all kinds of powder into bottles and pouches. 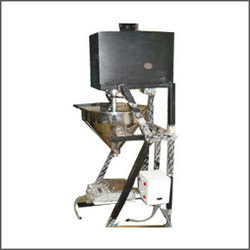 Having a filling range of 50-500 gm, this portable machine is known to deliver an accuracy of /- 1 gm. The powder filled is placed under the nozzle and once the machine presets the amount of water and displays the actual amount of powder on the weighing machine. Ensuring accuracy in powder filled, the container is then removed and the process is repeated till required. Single head powder filler is capable of filling all kinds of powders granules etc. automatically into bottles, jars etc. Powder filling machine is majorely used for filling free flowing powders and non free flowing powders. 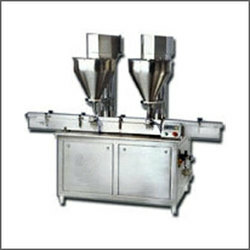 Powder filling machine also known as auger filler and powder dozing machine which is suitable to fill 1gm to 5000gm of any powder in bottles, cans, jars, tubs filling, chemical powder filling, talcum filling, juice powder filling, salt filling, sugar filling, nutrition powder filling, can filling, food powder filling. We fabricate our range of single head powder filling machines with utter precision to attain correctness and high efficiency. Our range of single head powder filling machines (SF series) is widely in demand in the market with an output of 15-18 bottles per minute. Equipped with a simple interface and no setting hassles, our range offers durability and reliability. This machine is ideal to fill all kinds of free flowing powders, talcum powder, toner powder etc. The machine is very smooth in functioning and very simple to operate .Its PLC based system ensures accuracy and output. Easy to commission and install. Dimensions 1.8m x 0.6 m x 2m height. Imported type conveyor system with guides etc. Filling range 20-2000gm can be provided. 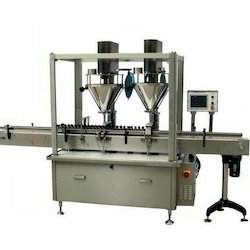 We offer a unique range of automatic dual head filling machine which is known for its excellent performance, smooth functioning and is very easy to operate. This machine is an ideal solution to fill all kinds of free flowing powder, talcum powder, toner powder or any other type of powder. Equipped with PLC based system ensures maximum accuracy and output and is easy in commissioning and installation. This machine is ideal to fill all kinds of free flowing powders, ,talcum powder, toner powder etc. The machine is very smooth in functioning and very simple to operate .Its PLC based system ensures accuracy and output. Easy to commission and install. Our company has earned accolades for providing Spices Filling Machine to the clients. This product is manufactured in sync with the industrial quality standards under the supervision of our experts using fine grade quality material. 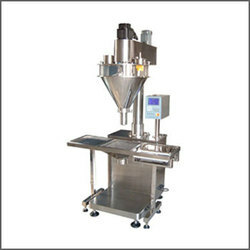 Semi Automatic Spices Filling Machine is widely used in food processing and other industries. Looking for Powder Filling Machines ?